This issue of CTTA observes three critical case studies of political violence and terrorism that highlight either countering terrorism or preventing violent extremism (PVE) policies as the key takeaways. Research has highlighted that improved and innovative counter-terrorism and PVE policies can mitigate the long-term effects of terrorism and extremism, and possibly prevent conflicts from occurring in the first place. Through the case study of the Philippines, this issue discusses identity-driven conflicts and the need for ‘hearts and minds’ driven approaches by the state for conflict resolution. In order to ensure long-term peace, the state should look into culturally-sensitive approaches that don’t alienate aggrieved groups and instead attempt to mainstream and integrate them into the broader society. Further, the issue delves into the influence and ideology of radical ideologues in the case of the Afghanistan -Pakistan region. The article highlights a national counter-narrative campaign can play a role in decreasing and countering the reverence and following of religious figures preaching intolerance and extremism. 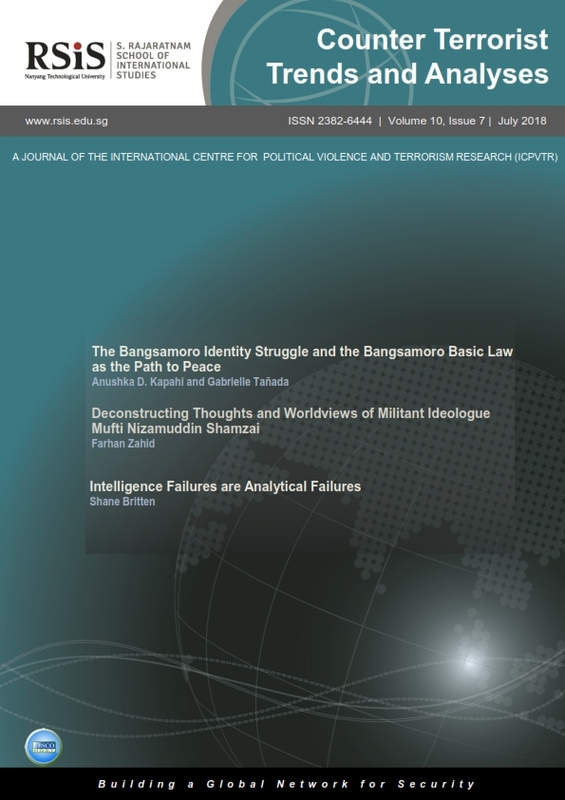 Lastly, the issue observes intelligence failures in terrorist attacks and recommends an improvement in related counter-terrorism policies through increased focus on cognitive analysis. This would allow states and related security agencies to respond better to emerging terrorist threats and prevent violent attacks from occurring. In the first article, Anushka D. Kapahi and Gabrielle Tañada analyse the interplay of history, religion and identity to explain the Bangsamoro people’s uprising in Mindanao, Southern Philippines. The authors argue that despite legal advancements, the Bangsamoro people’s demand for autonomy and self-governance still exists due to a lack of recognition of their cultural identity. This has obstructed conflict resolution, attempts at assimilation and overall development within the region, necessitating a culturally-sensitive approach that gives due consideration to locals’ identity for long-term peace. Farhan Zahid sheds light on the impact of influential Pakistani militant ideologue Mufti Nizam-ud-Din Shamzai’s worldview — in the form of fatwas, speeches, sermons and books — on various militant groups in the Af-Pak region. Shamzai is a celebrated scholar among Af-Pak militants and they continue to draw inspiration from his writings and teachings even after his assassination in 2004. However, Shamzai’s personality and works remain under -researched. The author recommends that formulating a national counter narrative against violent extremism while understanding the impact of his ideology on Af-Pak militant discourse is essential for policymakers in Pakistan. In the last article, Shane Britten reviews the importance of cognitive analytical techniques for accurate intelligence analysis in counterterrorism. He contends that lack of training in the art of cognitive analysis has been a major factor in various counter-terrorism intelligence failures in recent years. These intelligence failures are not of information-collection, but reflect the inability to adequately analyse the collected information. The author suggests that by improving the cognitive capabilities of intelligence analysts involved in counterterrorism through training and capacity building, the percentage of intelligence failures could be minimised.